Offer hummingbirds a fun and functional feeding station with the Droll Yankees Little Flyer Hummingbird Feeder. 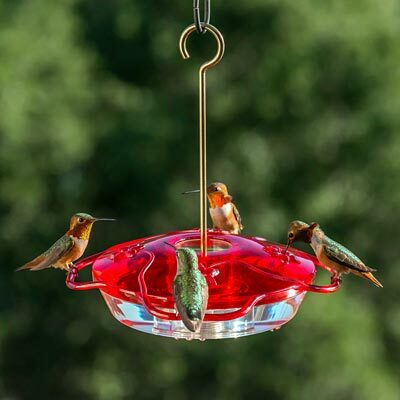 This traditional saucer feeder has a low profile, for you to watch the hummers with ease, and the four ports allow a few birds to dine at once. A perch at each port enables the birds to rest while dining if desired, and the vivid red color of the top helps attract them. A built-in ant moat in the center of the feeder keeps ants from sullying the nectar, while nectar guard tips keep flying insects from the feed. The 10 ounce capacity helps nectar stay fresh, and the snap-on cover creates a tight seal. Remove the cover for cleaning and refilling, and use the included brass rod to hang this item from a hook or bracket. The threaded base also allows the feeder to be pole mounted if desired. Its UV stabilized, acrylic construction forms a user friendly item, and the nectar recipe is embossed on the red lid for added convenience. Add a dynamic feeder to your yard with this Little Flyer Hummingbird Feeder. Lifetime warranty. Made in the USA.